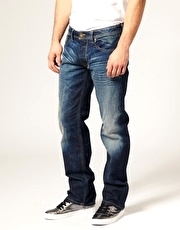 Produktbeskrivning för Diesel Larkee 8MD Straight Jeans: Straight jeans by Diesel . Featuring a fade effect wash, contrast stitching, logo strip to the coin pocket and a straight leg cut. ABOUT DIESEL Founded by Renzo Rosso in 1978, Diesel has since become a part of global youth culture, with its pioneering new styles and creative design methods. Known throughout the world for their jeans, Diesel now boasts a full clothing and accessories line that embraces the labels inimitable laid back style.